A couple of days ago in EID Journal: Seropositivity For H6 Influenza Viruses In China, we looked at a study that found a low, but significant level of antibodies – particularly among live bird handlers – to the avian H6 virus in China. This study was published not quite two years after the Taiwan CDC Reported the Human Infection With Avian H6N1. The H6N1 virus has been around for decades in Chinese poultry - it possesses similar internal genes to H5N1 and H9N2 (cite 2002 J Virol Molecular evolution of H6 influenza viruses from poultry in Southeastern China by Webster, Webby, Shortridge et al.) - and it has been speculated that it may have been involved in the genesis of H5N1 in Hong Kong in 1997. While viewed with some suspicion by virologists 15 years ago, once H5N1 emerged into the limelight again in 2003, H6N1 as a possible human threat receded back into the shadows. 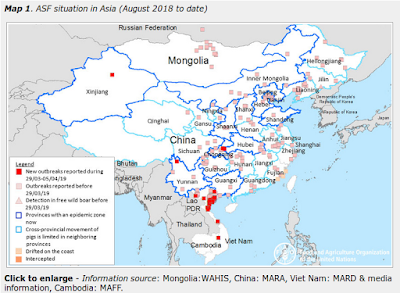 It was still studied as an avian threat, of course (see 2007’s Establishment of influenza A virus (H6N1) in minor poultry species in southern China), as it continued to spread (and reassort) across Southeast Asia. The discovery of the virus in a 20 year-old woman with pneumonia in Taiwan two years ago has, understandably, renewed interest in this viral contender, and we’ve seen a flurry of new studies as a result. Last March, in Avian Flu Antibody Survey In Poultry Workers – Taiwan 2012, we looked at a study that looked for antibodies to H5N2, H6N1, H7N3 and H7N9 among hundreds of subjects, and while they found a fairly low incidence of antibodies overall (max 2.99% for H5N2 in poultry vendors), only found one positive for H6N1. Also last March, in TSRI: H10N8 and H6N1 Bind Poorly To Human Receptor Cells - while ostensibly good news – researchers warned that both of these viruses bind differently than other avian viruses we’ve seen, and that our understanding of how these viruses mutate isn’t complete enough to warrant complacency. While one (known) human infection pales against the hundreds of H5N1 and H7N9 infections we’ve see over the past decade – it is one more than we’ve seen from H5N8, H5N2, and H5N3 - and it hints as to what is possible down the road. To this mix we add a new study, published in the EMBO Journal, that finds recent and worrisome changes in the receptor binding characteristics of the H6N1 virus. Changes they maintain have steadily moved the virus towards an affinity towards human receptor cells instead of avian receptor cells. Note: The G228S substitution mentioned in the Taiwan CDC report above plays heavily in this study. The receptor-binding specificity of influenza A viruses is a major determinant for the host tropism of the virus, which enables interspecies transmission. In 2013, the first human case of infection with avian influenza A (H6N1) virus was reported in Taiwan. To gather evidence concerning the epidemic potential of H6 subtype viruses, we performed comprehensive analysis of receptor-binding properties of Taiwan-isolated H6 HAs from 1972 to 2013. We propose that the receptor-binding properties of Taiwan-isolated H6 HAs have undergone three major stages: initially avian receptor-binding preference, secondarily obtaining human receptor-binding capacity, and recently human receptor-binding preference, which has been confirmed by receptor-binding assessment of three representative virus isolates. Mutagenesis work revealed that E190V and G228S substitutions are important to acquire the human receptor-binding capacity, and the P186L substitution could reduce the binding to avian receptor. Further structural analysis revealed how the P186L substitution in the receptor-binding site of HA determines the receptor-binding preference change. We conclude that the human-infecting H6N1 evolved into a human receptor preference. Historical analysis of influenza H6N1 isolates from 1972 until 2013, when the first human infection occurred, reveals amino acid changes that change receptor binding preference from birds to humans and therefore virus ability to cross the species barrier. Human-infecting avian influenza H6N1 has gained human receptor binding preference. H6N1 HA has changed binding preference in at least two steps. First, E190V and G228S substitutions provide human receptor binding ability. Subsequently, P186L substitution reduces avian receptor binding, and provides human receptor binding preference. For an influenza virus to infect a host, the virus must bind (attach) itself to the surface of a cell. To do that influenza viruses have an RBS - Receptor Binding Site (the area of its genetic sequence that allows it to attach to, and infect, host cells) that – like a key slipping into a padlock -`fit’ the host’s receptor cells. Avian adapted flu viruses, like the H5N1 virus, bind preferentially to the alpha 2,3 receptor cells found in the gastrointestinal tract of birds. While there are some alpha 2,3 cells deep in the lungs of humans, for an influenza to be successful in a human host, most researchers believe it needs to a able to bind to the α2-6 receptor cell found in the upper airway (trachea). Although a preferential binding to human receptor cells is considered perhaps the biggest obstacle for an avian virus to successfully jump species – it isn’t the only one. Another major requirement is the ability to replicate efficiently at the lower temperatures found in the upper respiratory system of humans, as opposed to the hotter gastrointestinal system of birds. There are other factors – some we know about, others we don’t – that must come together properly to allow an avian virus to jump species successfully. All of which means that even with an improved receptor binding ability, the H6N1 virus may be far from being ready for prime time. But it does mean that H6N1 is legitimately a virus worth watching, both for further evolutionary changes, and for how it behaves in poultry and in humans.